Liczba stron: 329 Jest to ujednolicona liczba stron, która ułatwi Ci porównanie długości książek. Każda strona Legimi to 200 słów. This is a copious and judicious selection from Chaucer’s Tales, with full notes on the history, manners, customs, and language of the fourteenth century, with marginal glossary and a literal poetical version in modern English in parallel columns with the original poetry. Six of the Canterbury Tales are thus presented, in sections of from 10 to 200 lines, mingled with prose narrative. ‘Chaucer for Schools’ is issued to meet a widely-expressed want, and is especially adapted for class instruction. It may be profitably studied in connection with the maps and illustrations of ‘Chaucer for Children.’ ‘We hail with pleasure the appearance of Mrs. Haweis’s “Chaucer for Schools.” Her account of “Chaucer the Tale-teller” is certainly the pleasantest, chattiest, and at the same time one of the soundest descriptions of the old master, his life and works and general surroundings, that have ever been written. The chapter cannot be too highly praised.’—Academy. ‘The authoress is in such felicitous harmony with her task, that the young student, who in this way first makes acquaintance with Chaucer, may well through life ever after associate Mrs. Haweis with the rare productions of the father of English poetry.’—School-Board Chronicle. ‘Unmistakably presents the best means yet provided of introducing young pupils to the study of our first great poet.’—Scotsman. ‘In her “Chaucer for Schools” Mrs. Haweis has prepared a great assistance for boys and girls who have to make the acquaintance of the poet. Even grown people, who like their reading made easy for them, will find the book a pleasant companion.’—Guardian. ‘The subject has been dealt with in such a full and comprehensive way, that the book must be commended to everyone whose study of early English poetry has been neglected.’—Daily Chronicle. ‘We venture to think that this happy idea will attract to the study of Chaucer not a few children of a larger growth, who have found Chaucer to be very hard reading, even with the help of a glossary and copious notes. Mrs. Haweis’s book displays throughout most excellent and patient workmanship, and it cannot fail to induce many to make themselves more fully acquainted with the writings of the father of English literature.’—Echo. ‘The book is a mine of poetic beauty and most scholarly explanation, which deserves a place on the shelves of every school library.’—School Newspaper. ‘For those who have yet to make the acquaintance of the sweet and quaint singer, there could not well be a better book than this. Mrs. Haweis is, of course, an enthusiast, and her enthusiasm is contagious. Her volume ought to be included in all lists of school books—at least, in schools where boys and girls are supposed to be laying the foundations of a liberal education.’—Literary World. ‘Mrs. Haweis has, by her “Chaucer for Schools,” rendered invaluable assistance to those who are anxious to promote the study of English literature in our higher and middle-grade schools.... Although this edition of Chaucer has been expressly prepared for school use, it will be of great service to many adult readers.’ —School Guardian. CHATTO & WINDUS, PICCADILLY, W.
All rights reserved. No part of this book shell be reproduced or transmitted in any form or by any means, electronic or mechanical, including photocopy, recording or by any information or retrieval system, without written permission form the publisher. FOREWORDS TO THE SECOND EDITION. Complaint of Chaucer to his Purse. PRINCIPAL AUTHORITIES CONSULTED IN THIS BOOK. Hugh Reginald Haweis (1838 –1901) was an English cleric and writer. He was the husband of author Mary Eliza Haweis and the father of painter Stephen Haweis. The Reverend H.R. Haweis was born in Egham, Surrey in 1838, the son of the Rev. John Oliver Willyams Haweis of Brighton, Canon of Chichester. He was educated privately in Sussex and at Trinity College, Cambridge, where he graduated BA in 1860. He travelled in Italy and served under Garibaldi in 1860. On his return to England he was ordained and held various curacies in London, becoming in 1866 incumbent of St James's, Marylebone. His unconventional methods of conducting the service, combined with his dwarfish figure and lively manner, soon attracted crowded congregations. He married Mary E. Joy in 1866, and both he and Mrs Haweis (d. 1898) contributed largely to periodical literature and travelled a good deal abroad. Haweis was Lowell lecturer in Boston, in 1885, and represented the Anglican Church at the Chicago Parliament of Religions in 1893. He was much interested in music, and wrote books on violins and church bells, besides contributing an article to the 9th edition of the Encyclopædia Britannica on “bell”. His best-known book was Music and Morals (1871), which went through sixteen editions before the end of the century, and he was for a time from 1868 editor of Cassell's Magazine. He also wrote the five-volume Christ and Christianity, a popular church history (1886–1887), as well as Travel and Talk (1896) and similar chatty and entertaining books. His book My Musical Life offers a biographical tour through his career and his spiritual leanings in music, tracing his awakening to music, his interest in the Cremonese violin makers and in Paganini, an exposition of The Ring of the Nibelungen, Parsifal, Lohengrin and Tannhäuser, and anecdotes of his meetings with Richard Wagner and Franz Liszt. The 1st Arch contains a glimpse of Palamon and Arcite fighting desperately, yet wounded oftener and sharplier by Love’s arrows than by each deadly stroke. The ruthless boy aloft showers gaily upon them his poisoned shafts. The 2nd contains Aurelius and Dorigen—that loving wife left on Breton shores, who was so nearly caught in the trap she set for herself. Aurelius offers her his heart aflame. It is true his attitude is humble, but she is utterly in his power—she cannot get away whilst he is kneeling on her dress. The 3rd represents the Summoner led away, but this time neither to profit nor to pleasure, by his horned companion. The wicked spirit holds the reins of both horses in his hand, and the Summoner already quakes in anticipation of what is in store for him. The 4th contains the three rioters. The emblem of that Death they sought so wantonly hangs over their heads; the reward of sin is not far off. The 5th Arch is too much concealed by the lock to do more than suggest one of Griselda’s babes. The Key, from which the book takes its name, we trust may unlock the too little known treasures of the first of English poets. The Daisy, symbol for all time both of Chaucer and of children, and thus curiously fitted to be the connecting link between them, may point the way to lessons fairer than flowers in stories as simple as daisies. Demy 8vo, cloth limp, 2s. 6d. 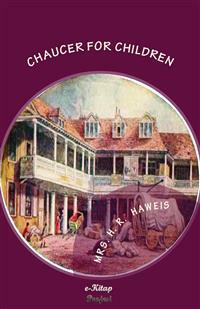 ‘We hail with pleasure the appearance of Mrs. Haweis’s “Chaucer for Schools.” Her account of “Chaucer the Tale-teller” is certainly the pleasantest, chattiest, and at the same time one of the soundest descriptions of the old master, his life and works and general surroundings, that have ever been written. The chapter cannot be too highly praised.’—Academy. ‘The authoress is in such felicitous harmony with her task, that the young student, who in this way first makes acquaintance with Chaucer, may well through life ever after associate Mrs. Haweis with the rare productions of the father of English poetry.’—School-Board Chronicle. ‘Unmistakably presents the best means yet provided of introducing young pupils to the study of our first great poet.’—Scotsman. ‘In her “Chaucer for Schools” Mrs. Haweis has prepared a great assistance for boys and girls who have to make the acquaintance of the poet. Even grown people, who like their reading made easy for them, will find the book a pleasant companion.’—Guardian. ‘The subject has been dealt with in such a full and comprehensive way, that the book must be commended to everyone whose study of early English poetry has been neglected.’—Daily Chronicle. ‘We venture to think that this happy idea will attract to the study of Chaucer not a few children of a larger growth, who have found Chaucer to be very hard reading, even with the help of a glossary and copious notes. Mrs. Haweis’s book displays throughout most excellent and patient workmanship, and it cannot fail to induce many to make themselves more fully acquainted with the writings of the father of English literature.’—Echo. ‘The book is a mine of poetic beauty and most scholarly explanation, which deserves a place on the shelves of every school library.’—School Newspaper. ‘For those who have yet to make the acquaintance of the sweet and quaint singer, there could not well be a better book than this. Mrs. Haweis is, of course, an enthusiast, and her enthusiasm is contagious. Her volume ought to be included in all lists of school books—at least, in schools where boys and girls are supposed to be laying the foundations of a liberal education.’—Literary World. ‘Mrs. Haweis has, by her “Chaucer for Schools,” rendered invaluable assistance to those who are anxious to promote the study of English literature in our higher and middle-grade schools.... Although this edition of Chaucer has been expressly prepared for school use, it will be of great service to many adult readers.’—School Guardian. CHATTO & WINDUS, PICCADILLY, W.
KNIGHT. SQUIRE. BOY. WIFE OF BATH. PRIORESS. CHAUCER (A CLERK). FRIAR. MINE HOST.MONK. SUMMONER. PARDONER. SECOND NUN. FRANKLIN. MINE HOST ASSEMBLING THE CANTERBURY PILGRIMS. CHIEFLY FOR THE USE AND PLEASURE OFMY LITTLE LIONEL,FOR WHOM I FELT THE NEED OF SOME BOOK OF THE KIND,I HAVE ARRANGED AND ILLUSTRATED THISCHAUCER STORY-BOOK. In revising Chaucer for Children for a New Edition, I have fully availed myself of the help and counsel of my numerous reviewers and correspondents, without weighting the book, which is really designed for children, with a number of new facts, and theories springing from the new facts, such as I have incorporated in my Book for older readers, Chaucer for Schools. Curious discoveries are still being made, and will continue to be, thanks to the labours of men like Mr. F. J. Furnivall, and many other able and industrious scholars, encouraged by the steadily increasing public interest in Chaucer. I must express my sincere thanks and gratification for the reception this book has met with from the press generally, and from many eminent critics in particular; and last, not least, from those to whom I devoted my pleasant toil, the children of England. A Chaucer for Children may seem to some an impossible story-book, but it is one which I have been encouraged to put together by noticing how quickly my own little boy learned and understood fragments of early English poetry. I believe that if they had the chance, many other children would do the same. I think that much of the construction and pronunciation of old English which seems stiff and obscure to grown up people, appears easy to children, whose crude language is in many ways its counterpart. The narrative in early English poetry is almost always very simply and clearly expressed, with the same kind of repetition of facts and names which, as every mother knows, is what children most require in story-telling. The emphasis which the final E gives to many words is another thing which helps to impress the sentences on the memory, the sense being often shorter than the sound. It seems but natural that every English child should know something of one who left so deep an impression on his age, and on the English tongue, that he has been called by Occleve “the finder of our fair language.” For in his day there was actually no national language, no national literature, English consisting of so many dialects, each having its own literature intelligible to comparatively few; and the Court and educated classes still adhering greatly to Norman-French for both speaking and writing. Chaucer, who wrote for the people, chose the best form of English, which was that spoken at Court, at a time when English was regaining supremacy over French; and the form he adopted laid the foundation of our present National Tongue. Chaucer is, moreover, a thoroughly religious poet, all his merriest stories having a fair moral; even those which are too coarse for modern taste are rather naïve than injurious; and his pages breathe a genuine faith in God, and a passionate sense of the beauty and harmony of the divine work. The selections I have made are some of the most beautiful portions of Chaucer’s most beautiful tales. I believe that some knowledge of, or at least interest in, the domestic life and manners of the 13th, 14th, and 15th centuries, would materially help young children in their reading of English history. The political life would often be interpreted by the domestic life, and much of that time which to a child’s mind forms the dryest portion of history, because so unknown, would then stand out as it really was, glorious and fascinating in its vigour and vivacity, its enthusiasm, and love of beauty and bravery. There is no clearer or safer exponent of the life of the 14th century, as far as he describes it, than Geoffrey Chaucer. As to the difficulties of understanding Chaucer, they have been greatly overstated. An occasional reference to a glossary is all that is requisite; and, with a little attention to a very simple general rule, anybody with moderate intelligence and an ear for musical rhythm can enjoy the lines. In the first place, it must be borne in mind that the E at the end of the old English words was usually a syllable, and must be sounded, as Aprillē, swootĕ, &c.
Note, then, that Chaucer is always rhythmical. Hardly ever is his rhythm a shade wrong, and therefore, roughly speaking, if you pronounce the words so as to preserve the rhythm all will be well. When the final e must be sounded in order to make the rhythm right, sound it, but where it is not needed leave it mute. You see that in those words which I have put in italics the final E must be sounded slightly, for the rhythm’s sake. How much of the beauty and natural swing of Chaucer’s poetry is lost by translation into modern English, is but too clear when that beauty is once perceived; but I thought some modernization of the old lines would help the child to catch the sense of the original more readily: for my own rendering, I can only make the apology that when I commenced my work I did not know it would be impossible to procure suitable modernized versions by eminent poets. Finding that unattainable, I merely endeavoured to render the old version in modern English as closely as was compatible with sense, and the simplicity needful for a child’s mind; and I do not in any degree pretend to have rendered it in poetry. The beauty of such passages as the death of Arcite is too delicate and evanescent to bear rough handling. But I may here quote some of the lines as an example of the importance of the final e in emphasizing certain words with an almost solemn music. There is hardly anything finer than Chaucer’s version of the story of these passionate young men, up to the touching close of Arcite’s accident and the beautiful patience of death. In life nothing would have reconciled the almost animal fury of the rivals, but at the last such a resignation comes to Arcite that he gives up Emelye to Palamon with a sublime effort of self-sacrifice. Throughout the whole of the Knight’s Tale sounds as of rich organ music seem to peal from the page; throughout the Clerk’s Tale one seems to hear strains of infinite sadness echoing the strange outrages imposed on patient Grizel. But without attention to the rhythm half the grace and music is lost, and therefore it is all-important that the child be properly taught to preserve it. I have adhered generally to Morris’s text (1866), being both good and popular, only checking it by his Clarendon Press edition, and by Tyrwhitt, Skeat, Bell, &c., when I conceive force is gained, and I have added a running glossary of such words as are not immediately clear, on a level with the line, to disperse any lingering difficulty. In the pictures I have been careful to preserve the right costumes, colours, and surroundings, for which I have resorted to the MSS. of the time, knowing that a child’s mind, unaided by the eye, fails to realize half of what comes through the ear. Children may be encouraged to verify these costumes in the figures upon many tombs and stalls, &c., in old churches, and in old pictures. In conclusion I must offer my sincere and hearty thanks to many friends for their advice, assistance, and encouragement during my work; amongst them, Mr. A. J. Ellis, Mr. F. J. Furnivall, and Mr. Calderon. Whatever may be the shortcomings of the book, I cannot but hope that many little ones, while listening to Chaucer’s Tales, will soon begin to be interested in the picturesque life of the middle ages, and may thus be led to study and appreciate ‘The English Homer’ by the pages I have written for my own little boy. The mother should read to the child a fragment of Chaucer with the correct pronunciation of his day, of which we give an example below, inadequate, of course, but sufficient for the present purpose. The whole subject is fully investigated in the three first parts of the treatise on ‘Early English Pronunciation, with special reference to Shakespere and Chaucer,’ by Alexander J. Ellis, F.R.S. The a is, as in the above languages, pronounced as in âne, appeler, &c. E commonly, as in écarté, &c. The final e was probably indistinct, as in German now, habe, werde, &c.—not unlike the a in China: it was lost before a vowel. The final e is still sounded by the French in singing. In old French verse, one finds it as indispensable to the rhythm as in Chaucer,—and as graceful,—hence probably the modern retention of the letter as a syllable in vocal music. Ou is sounded as the French ou. I generally as on the Continent, ee: never as we sound it at present. Ch as in Scotch and German. I quote the opening lines of the Prologue as the nearest to hand. Whan that Aprille with his schowres swooteThe drought of Marche hath perced to the roote,And bathud every veyne in swich licour,Of which vertue engendred is the flour;Whan Zephirus eek with his swete breetheEnspirud hath in every holte and heetheThe tendre croppes, and the yonge sonneHath in the Ram his halfe cours i-ronne,And smale fowles maken melodie,That slepen al the night with open yhe,So priketh hem nature in here corages—&c.Whan that Aprilla with his shōōrĕs sohtaThe drŏŏkht of March hath pairsed to the rohta,And bahthed ev’ry vīn in sweech licōōr,Of which vairtú enjendrèd is the flōōr;Whan Zephirŏŏs aik with his swaita braithaEnspeered hath in ev’ry holt and haithaThe tendra croppes, and the yŏŏnga sŏŏnnaHath in the Ram his halfa cōōrs i-rŏŏnna,And smahla fōōles mahken melodee-a,That slaipen al the nikht with ohpen ee-a,So pricketh hem nahtúr in heer coràhges, &c.
I think that any one reading these lines twice over as I have roughly indicated, will find the accent one not difficult to practise; and the perfect rhythm and ring of the lines facilitates matters, as the ear can frequently guide the pronunciation. The lines can scarcely be read too slowly or majestically. I must not here be understood to imply that difficulties in reading and accentuating Chaucer are chimerical, but only that it is possible to understand and enjoy him without as much difficulty as is commonly supposed. In perusing the whole of Chaucer, there must needs be exceptional readings and accentuation, which in detail only a student of the subject would comprehend or care for. The rough rule suggested in the preface is a good one, as far as the rhythm goes: as regards the sound, I have given a rough example. Ther was also a nonne, a prioresse,That of hire smylyng was ful symple and coy;Hire gretteste ooth nas but by Seynte Loy;And sche was cleped Madame Eglentyne.Ful wel sche sang the servise devyne,Entuned in hire nose ful semyly;And Frensch sche spak ful faire and fetysly,Aftur the scole of Stratford atte Bowe,For Frensch of Parys was to hire unknowe.Ther was ahlsoa a nŏŏn, a preeoressa,That of her smeeling was fŏŏl sim-pland cooy;Heer graitest ohth nas bŏŏt bee Sī-ent Looy,And shay was cleppèd Màdam Eglanteena.Fŏŏl well shay sang the servicĕ divinä,Entúned in heer nohsa fŏŏl saimaly;And French shai spahk fŏŏl fēr and faitisly,Ahfter the scohl of Strahtford ahtta Bow-a,For French of Pahrees was toh her ŏŏn-know-a. Observe simpland for simple and: simple being pronounced like a word of one syllable. With the common English pronunciation the lines would not scan. ‘Vernicle,’ ‘Christofre,’ ‘wimple,’ ‘chilindre,’ ‘companable,’ &c., are further instances of this mute e, and may be read as French words. Do you like hearing stories? I am going to tell you of some one who lived a very long time ago, and who was a very wise and good man, and who told more wonderful stories than I shall be able to tell you in this little book. But you shall hear some of them, if you will try and understand them, though they are written in a sort of English different from what you are accustomed to speak. But, in order that you really may understand the stories, I must first tell you something about the man who made them; and also why his language was not the same as yours, although it was English. His name was Chaucer—Geoffrey Chaucer. You must remember his name, for he was so great a man that he has been called the ‘Father of English Poetry’—that is, the beginner or inventor of all the poetry that belongs to our England; and when you are grown up, you will often hear of Chaucer and his works. Chaucer lived in England 500 years ago—a longer time than such a little boy as you can even think of. It is now the year 1876, you know. Well, Chaucer was born about 1340, in the reign of King Edward III. We should quite have forgotten all Chaucer’s stories in such a great space of time if he had not written them down in a book. But, happily, he did write them down; and so we can read them just as if he had only told them yesterday. If you could suddenly spring back into the time when Chaucer lived, what a funny world you would find! Everybody was dressed differently then from what people are now, and lived in quite a different way; and you might think they were very uncomfortable, but they were very happy, because they were accustomed to it all. People had no carpets in those days in their rooms. Very few people were rich enough to have glass windows. There was no paper on the walls, and very seldom any pictures; and as for spring sofas and arm-chairs, they were unknown. The seats were only benches placed against the wall: sometimes a chair was brought on grand occasions to do honour to a visitor; but it was a rare luxury. The rooms of most people in those days had blank walls of stone or brick and plaster, painted white or coloured, and here and there—behind the place of honour, perhaps—hung a sort of curtain, like a large picture, made of needlework, called tapestry. You may have seen tapestry hanging in rooms, with men and women and animals worked upon it. That was almost the only covering for walls in Chaucer’s time. Now we have a great many other ornaments on them, besides tapestry. The rooms Chaucer lived in were probably like every one’s else. They had bare walls, with a piece of tapestry hung here and there on them—a bare floor, strewn with rushes, which must have looked more like a stable than a sitting-room. But the rushes were better than nothing. They kept the feet warm, as our carpets do, though they were very untidy, and not always very clean. When Chaucer wanted his dinner or breakfast, he did not go to a big table like that you are used to: the table came to him. A couple of trestles or stands were brought to him, and a board laid across them, and over the board a cloth, and on the cloth were placed all the curious dishes they ate then. There was no such thing as coffee or tea. People had meat, and beer, and wine for breakfast, and dinner, and supper, all alike. They helped themselves from the common dish, and ate with their fingers, as dinner-knives and forks were not invented, and it was thought a sign of special good breeding to have clean hands and nails. Plates there were none. But large flat cakes of bread were used instead; and when the meat was eaten off them, they were given to the poor—for, being full of the gravy that had soaked into them, they were too valuable to throw away. When they had finished eating, the servants came and lifted up the board, and carried it off. And now for Chaucer himself! How funny you would think he looked, if you could see him sitting in his house! He wore a hood, of a dark colour, with a long tail to it, which in-doors hung down his back, and out of doors was twisted round his head to keep the hood on firm. This tail was called a liripipe. He did not wear a coat and trousers like your father’s, but a sort of gown, called a tunic, or dalmatic, which in one picture of him is grey and loose, with large sleeves, and bright red stockings and black boots; but on great occasions he wore a close-fitting tunic, with a splendid belt and buckle, a dagger, and jewelled garters, and, perhaps, a gold circlet round his hair. How much prettier to wear such bright colours instead of black! men and women dressed in green, and red, and yellow then; and when they walked in the streets, they looked as people look in pictures. DINNER IN THE OLDEN TIME. Chaucer lived, like you, in London. Whether he was born there is not known; but as his father, John Chaucer, was a vintner in Thames Street, London, it is probable that he was. Not much is known about his parents or family, except that his grandfather, Richard Chaucer, was also a vintner; and his mother had an uncle who was a moneyer; so that he came of respectable and well-to-do people, though not noble. Whether he was educated at Oxford or Cambridge, whether he studied for the bar or for the Church, there is no record to show; but there is no doubt that his education was a good one, and that he worked very hard at his books and tasks, otherwise he could not have grown to be the learned and cultivated man he was. We know that he possessed considerable knowledge of the classics, divinity, philosophy, astronomy, as much as was then known of chemistry, and, indeed, most of the sciences. French and Latin he knew as a matter of course, for the better classes used these tongues more than English—Latin for writing, and French for writing and speaking; for, by his translations from the French, he earned, early in life, a ‘balade’ of compliment from Eustache Deschamps, with the refrain, ‘Grant translateur, noble Geoffroi Chaucier.’ It is probable, too, that he knew Italian, for, in his later life, we can see how he has been inspired by the great Italian writers, Dante, Petrarch, and Boccaccio. It has recently been discovered that for a time (certainly in 1357) Geoffrey Chaucer, being then seventeen, was a page in the household of Elizabeth, Countess of Ulster, wife of Lionel, second son of King Edward III. ; a position which he could not have held if he had not been a well-born, or at least well-educated, person. A page in those days was very different from what we call a page now—therefore we infer that the Chaucer family had interest at Court; for without that, Geoffrey could never have entered the royal service. Most gentlemen’s sons were educated by becoming pages. They entered the service of noble ladies, who paid them, or sometimes were even paid for receiving them. Thus young men learned courtesy of manners, and all the accomplishments of indoor and outdoor life—riding, the use of arms, &c.—and were very much what an aide-de-camp in the army now is. Chaucer, you see, held a post which many a nobly-born lad must have coveted. There is a doubtful tradition that Chaucer was intended for a lawyer, and was a member of the Middle Temple (a large building in London, where a great many lawyers live still), and here, as they say, he was once fined two shillings for beating a Franciscan friar in Fleet Street. If this be true, it must have been rather a severe beating; for two shillings was a far larger sum than it is now—equal to about sixteen shillings of our money. Chaucer was sometimes angry with the friars at later times in life, and deals them some hard hits in his writings with a relish possibly founded on personal experience of some disagreeable friar. At any rate, Chaucer never got fond of the friars, and thought they were often bad and mischievous men, who did not always act up to what they said. This is called hypocrisy, and is so evil a thing that Chaucer was quite right to be angry with people who were hypocrites. Fleet Street still exists, though it was much less crowded with people in Chaucer’s day than now. Indeed, the whole of London was very different from our London; and, oh, so much prettier! The streets within the London wall were probably thickly populated, and not over-healthy; but outside the wall, streets such as Fleet Street were more like the streets of some of our suburbs, or rather some foreign towns—the houses irregular, with curious pointed roofs, here and there divided by little gardens, and even green fields. I dare say, when Chaucer walked in the streets, the birds sang over his head, and the hawthorn and primrose bloomed where now the black smoke and dust would soon kill most green things. Thames Street was where Chaucer long lived in London, but, at one time in his life at least, it is certain that he occupied a tenement at Aldgate, which formed part of an old prison; and it is probable that at another he lived in the beautiful Savoy Palace with John of Gaunt, whilst his wife was maid of honour. In 1393, Chaucer was living at Greenwich, near which he had work in 1390—poor and asking his friend Scogan to intercede for him “where it would fructify;” and at the end of his life he had a house in Westminster, said to be nearly on the same spot on which Henry VII.’s Chapel now stands, and close to the Abbey where he is buried. In those days it was the fashion, when the month of May arrived, for everybody, rich and poor, to get up very early in the morning, to gather boughs of hawthorn and laurel, to deck all the doorways in the street, as a joyful welcoming of the sweet spring time. Chaucer alludes more than once to this beautiful custom. The streets must have been full of fragrance then. He also tells us how he loved to rise up at dawn in the morning, and go into the fresh green fields, to see the daisies open. You have often seen the daisies shut up at night, but I don’t suppose you ever saw them opening in the morning; and I am afraid, however early you got up in London, you could not reach the fields quick enough to see that. But you may guess from this how much nearer the country was to the town 500 years ago. There were so many fewer houses built then, that within a walk you could get right into the meadows. You may see that by comparing the two maps I have made for you. London was also much quieter. There were no railways—such things had never been heard of. There were not even any cabs or carriages. Sometimes a market cart might roll by, but not very often, and then everybody would run out to see what the unaccustomed clatter was all about. People had to walk everywhere, unless they were rich enough to ride on horseback, or lived near the river. In that case, they used to go in barges or boats on the Thames, as far as they could; for, strange as it may seem, even the King had no coach then. London in the 15th Century. London in the 19th Century. I am afraid Geoffrey Chaucer would not recognize that ‘dere and swete citye of London’ in the great, smoky, noisy, bustling metropolis we are accustomed to, and I am quite sure he would not recognize the language; and presently I will explain what I meant by saving that though Chaucer spoke and wrote English, it was quite different from what we speak now. You will see, as you go on, how queerly all the words are spelt, so much so that I have had to put a second version side by side with Chaucer’s lines, which you will understand more readily; and when I read them to you, you will see how different is the sound. These words were all pronounced slowly, almost with a drawl, while we nowadays have got to talk so fast, that no one who lived then would follow what we say without great difficulty. Chaucer’s connection with the Court makes it probable that he lived during the greater part of his life in London; and it is pleasant to think that this great poet was valued and beloved in his day by the highest powers in the land. He held, at various times, posts in the King’s household, which brought him more or less money, such as valet of the King’s chamber, the King’s esquire, &c.; and he found a fast friend in John of Gaunt, one of the sons of King Edward III. In 1359 Chaucer became a soldier, and served in the army under this King, in an attack upon France, and was taken prisoner. It is supposed he was detained there about a year; and, being ransomed by Edward, when he came back to England, he married a lady named Philippa. She was probably the younger daughter of Sir Paon de Roet, of Hainault, who came over to England in the retinue of Queen Philippa, who was also of Hainault. These two Philippas, coming from the same place, remained friends during all the Queen’s life; for when Chaucer married Philippa de Roet, she was one of the Queen’s maids of honour; and, after her marriage, the Queen gave her an annual pension of ten marks (£50), which was continued to her by the King after Queen Philippa died. Some people say Chaucer’s wife was also the Queen’s god-daughter.